Good morning, sewalongers! Today we are going to cut our fabric; the last step before we can start SEWING! While cutting fabric tends to be a bit of a no-brainer kind of thing for me, I wanted to include this post so I could also chat with y'all about working with silks and slippery fabrics. Working with any sort of fluid fabric - from slippery silks to floaty chiffons - seems like it should be a terrifying idea, in theory. Lord knows I avoided any sort of difficult fabrics for years, chalking it up to Not Worth It. However, I've learned a few little tips - some from my new job, some from just hacking around and discovering it for myself - and I've realized that sewing with the slinky can be almost as easy as sewing with a cotton. The secret is cutting it accurately from the get-go. The first thing you need to do (well, second - prewash your fabric first ;)) is make sure that your cut edge is as straight as possible. This will help you line up the fabric into a perfect fold, and thus ensure accurate cutting once you pin those pattern pieces on. Pick a cut edge, any cut edge. See how it looks mostly straight? It's not, that's a LIE. We are gonna fix that, though. Use your scissors to snip a little bit past the selvedge. Don't go too crazy - you just need enough so you can firmly hold the clipped part. Cut about an inch or so above the edge. Now for the fun part - ripping! Grab the piece you cut and pull it firmly until it starts ripping, and go all the way across to the opposite selvedge. You may have to cut through the selvedge to completely disconnect it; don't try to force it if it doesn't want to rip. You should end up with a cut edge that is perfectly straight. 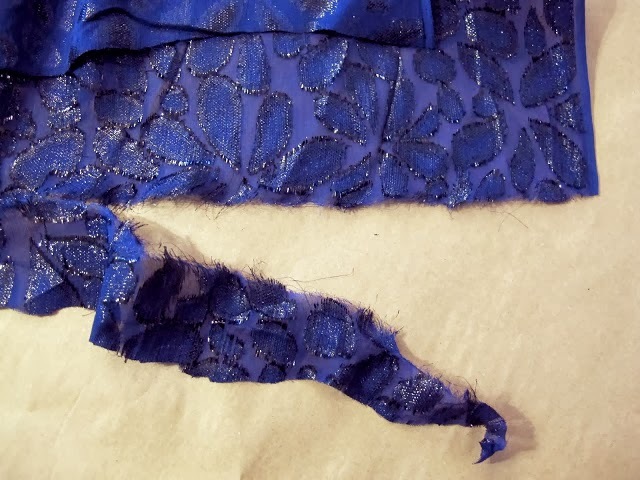 Sometimes, you may end up ripping and realizing part of the way through that your edge is SO uneven that you didn't cut high enough to start the rip. That's ok - just go back to the beginning, snip a bit higher, and rip again. You want a clean rip that goes all the way across the entire width of the fabric, selvedge to selvedge. Anyway, back to the task at hand! Once your edge is super ripped and awesome, fold your fabric in half with wrong sides together and exactly match the selvedges and cut edges. Use pins to keep the edges together so your fabric doesn't shift around. I like to use silk pins because they are smaller and as less likely to tear holes in delicate fabrics. Plus, they're kinda fancy! Now start laying your pattern pieces on the fabric to prep for cutting. I like to check that my fabric is perfectly on-grain, by measuring from the grainline to the selvedge and checking that it is the same distance all the way across each grainline. Again, this is super important with these slippery fabrics - otherwise, you'll cut the piece and it will have somehow morphed into a map of the United States. Once everything is good and straight, you can pin the pieces down - I use a lot of pins, ain't no shame - and start cutting. For accurate cutting, there's not much I can tell you other than don't rush, take your time, and try to cut using the entire length of the scissors - not a bunch of timid little snips (what, you want your edges to look fringed? Stop doing that!). You can also use a rotary cutter, if that's your thing. Then carefully open the fabric and you should see the pin sticking the two pieces together. You can use this as a guide to accurately mark both layers of fabric at the same time. Finally, clip all your notches. Remember that the seam allowance here is 1cm/3/8", so keep the snips tiny as to not exceed the seam allowance. - Make sure you are using the correct size needle. I like to get these Microtex needles - they are fine, sharp, and will not leave giant holes in fine fabrics. - As I mentioned earlier, silk pins are a lovely thing to have on hand for silks. Like the needles, the points are very small and sharp and will not distort your fabrics. Bonus - these have glass heads, which means they won't melt if you accidentally iron over them. - I know plenty of bloggers who sweater by Sullivan's Spray Stabilizer for wrestling their silks into submission before cutting and sewing, but I personally have never tried this stuff. I find that a good, accurate cut is enough to make the rest of the sewing fairly straightforward. - Ready to start sewing? Keep your delicate fabric from getting chewed up by the feed dogs by very carefully holding the thread tails as you sew the first few stitches. Don't pull - just hold the threads to guide them into moving along so they don't get sucked into the machine. That's it for today! Next week, we start sewing! Yay!